Dani Rodrik keeps reminding us that one of the factors slowing down the anti-poverty fight in Africa is the slow growth in manufacturing which comes with the risk of “premature” de-industrialization. Economic histories of several countries over the last two centuries tells us that rapid and sustained growth only occurred on the back of industrialization. In Africa on the other hand manufacturing is still a paltry 10.1% of annual output on average (and ranges between 10-14%, which is bad for a developing region). Compare this to 34% in Thailand, 31% in South Korea and 24% in Malaysia. 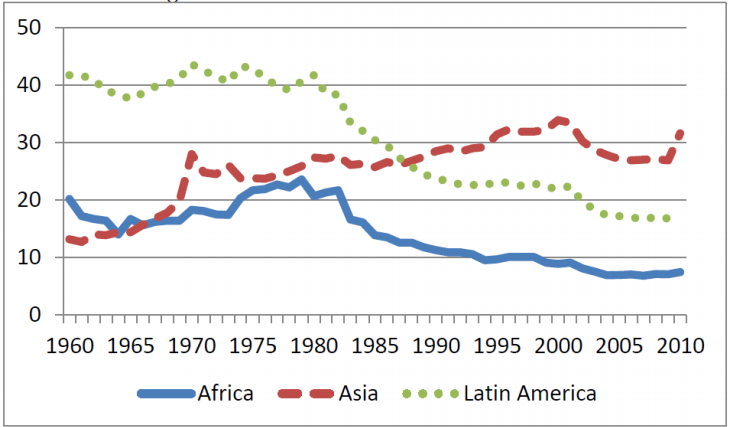 Furthermore, productivity in the manufacturing sector in Africa has actually declined over the last 40 years (see figure below). Now, starry-eyed technophile African leaders can talk about leapfrogging the historical stages of economic growth until the cows come home but there is no hiding from the fact that sustained growth and reduction of poverty will only come once Africa’s poor (up to 70% of whom still depend on subsistence agriculture in SSA) have access to well paying jobs. Yes, the types of jobs and products will be different, from say steam powered 18-19th century northwestern Europe or even 20th century East Asia, but there will have to be jobs for the masses. M-apps won’t do, as they will only benefit those who are already well off (mainly the creators), once they are sufficiently monetized. Asking poor people to be “entrepreneurial” with high interest micro-loans and grow themselves out of poverty as a matter of national development policy will also not work. The difference between a country with $1,500 and $15,000 of income a head is simple: industry. All the microfinance and microenterprise programs in the world are not going to build large firms and import technology and provide most people with what they really want: a stable job, regular wages, and a decent work environment. The good thing is that in quite a few countries on the Continent structural conditions favorable to mass job creation are beginning to congeal. Hopefully sooner, rather than later, PRSPs will start focusing less on pro-poverty “pro-poor” initiatives and more on strategies for mass job creation. Remember, “making the lives of poor people better is not the same thing as fighting poverty.” Over to you Development Economists and African policymakers.